How do you get this . 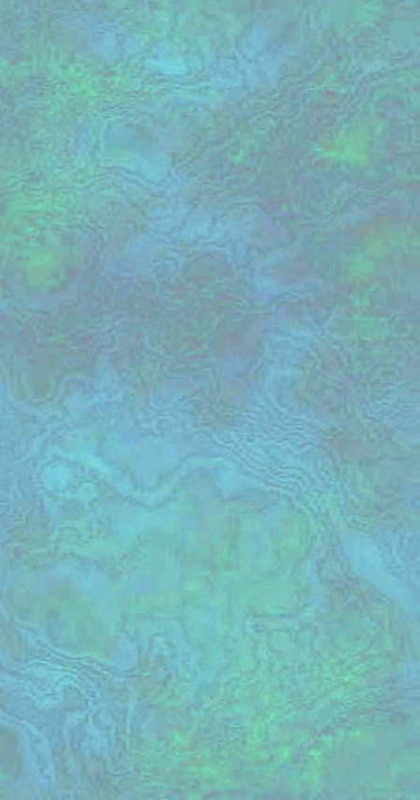 . .
...then click to paste THE ENTIRE PAGE into Text2GED! "How fast can you click?" 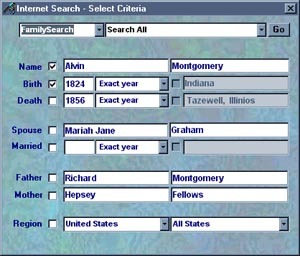 Text2GED quickly and accurately converts genealogy data displayed in a web browser into standard GEDCOM 5.5 file format. Text2GED bridges the gap between genealogical information found on the internet and your genealogy database program. 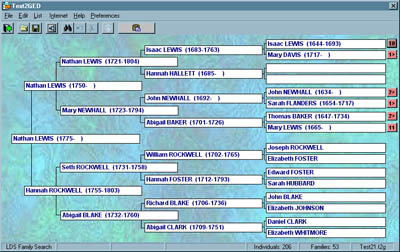 Instead of manually typing in each little bit of genealogy data from your keyboard, with just a click of your mouse Text2GED lets you copy and paste entire pages full of data - page after page after page - and then automatically converts it all to standard GEDCOM 5.5 format for import into your favorite family tree program. Manual entry of genealogy data is often tedious, tiresome, and time-consuming. Text2GED automates that part of the process, so your excitement at finding more branches of your family tree on the internet can remain undiminished by tedium and time constraints. Consider Text2GED as an exceedingly fast (and accurate!) typist and faithful scribe. A super-scribe, if you will. Super-duper, even. 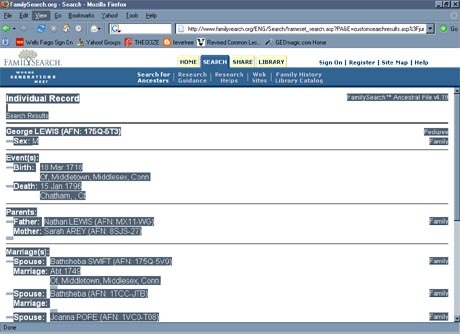 After launching Text2GED, begin by pulling up your favorite genealogy website and do a typical search for an ancestor (see below for a current list of recognizable website pages and formats). 3) right-click inside the highlighted browser window once more, and this time click on "Copy"
This will capture all the text on the web page and copy all that data onto the Clipboard. You've done this before, right? 4) click on the wide grey rectangled button with the clipboard picture in the middle. This will copy (or rather "paste") the Clipboard data into Text2GED. Before you can blink, the Text2GED tree window will show in pedigree format the beginnings of the family branch you're working on. All the names contained on that page of the website, all the dates and places (birth, christening, death, burial, and marriage), and all notes (if any) are now all in the Text2GED program with all their relational links recorded and preserved. Like magic! Auto-magic! Now go back to the web page you're pulling information from and click on a parent's or child's link (or in some cases such as LDS a "family" link). When the page appears, repeat steps 1 through 4. Continue on, selecting all-copying-and-pasting into Text2GED through the remainder of the pages at the web site. Rinse and repeat until you get to the end of the branch. The pedigree tree in Text2GED will continue to grow as you continue to copy and paste. And it's all in there. Go look! Does this beat typing it all in or what! When you're sure you've got all the data and you're satisfied they require no further editing or polishing (see additional features below), you may save it to a GEDCOM file for importing into your genealogy database program. Or, you can save your work to a workfile if you'd like, and pick it up later right where you left off. Or, you could go to some other genealogy website and see if they might have even more names or additional data to add to what you've already got. With Text2GED you can mix and match data captured from many different genealogy websites. Another tack you might consider following is to begin with a Descendant Register or an Ahnentafel List. Text2GED can capture data from web pages in those formats, too. It's not much a stretch to be able to get over 200 names (I've seen some lists with over 1400 - Text2GED can handle it), with dates, places, and relationships, in just 6 clicks. Two seconds, two hundred plus relatives sitting in your tree! And not a single typo! Super-duper indeed! Text2GED can process Pedigree Forms and Descendant lists, as well. Because these formats typically do not include as much data as individual or family formats, additional information can be gathered by navigating through the list in the browser window and drilling down to the detail level, and then pasting those details into Text2GED page by page. Or even better, use the Internet Search function in Text2GED. Text2GED doesn't just add records - it can also update them with any additional information you might find from any recognizable site - Text2GED is able to identify matching records by IDs, or by name and birth date, or names of spouses or parents. And if it's not sure if it's got a true match, it'll ask you. It's smart, and smart enough to know when it's not that smart. Data Display: Text2GED's pedigree view is similar to most other programs' pedigree views. It displays five generations of names at a time (31 in all) along with birth and death dates. If a branch reaches out beyond five generations an extension button is displayed, allowing for navigation further along the branch. Clicking on a name in the pedigree tree will show Birth/Marriage/Death dates and places for that individual, as well as spouse and children. If a person has more than one spouse, clicking the arrow at the right of the box will show a list of all their spouses. Simply click on a name to select from the list -the list of children will change accordingly, as will marriage date and place. Double-clicking on a name in a child list will re-order the pedigree tree, moving the selected child to the base of the branch. Numbers to the right of the marriage date and place are the couple's respective ages at marriage. Right-clicking on a name in the pedigree pops up a short menu from which you may select from four options: search the Internet for that individual, edit data in that individual's record, show a descendancy list, or delete/prune. Data Lists: from the Lists Menu you can pull up a list of all the names, with birth dates and places, record numbers and IDs. Or a list of marriages with names of husband and wife, marriage date and place, and number of children. Both lists may be reordered according to name, date, or place. Double-clicking on a name in a list opens a window for viewing/changing that individual's record. Data Edits: from the Edit Menu you can list and then quickly change place names en mass; or change all surnames to All CAPS or proper case with just one click. For manual down and dirty edits, right-click the mouse on a name in the pedigree tree and select Edit to display an individual's entire record - from there you can modify, insert or remove data; or click Unlink to remove that individual from the parents family record. There's also a Prune function, in case you'd like to cut off part of a suspect branch. Source Recording: Text2GED remembers where you got the data, and gives you options for including source citations in the GEDCOM file. Source and Repository records and references may also be added, modified, or removed. Files: Text2GED affords standard and expected file Open and Save procedures. Save to either a GEDCOM file or a work file. You may have as many work files as you want, and they can be re-opened at any time for additions and/or changes to your data. ToolTips text messages display when you move your mouse over a button or a text box. Oh! And check out the Internet Search feature. Right-click on a name in the pedigree tree, select Search Internet, and it'll load the search fields for you. Simply select from the lists on top which site you want to search in, flag the fields you'd like to set as search criteria, click Go and you're there. Play around with it a bit and you'll see how this might be a cool little tool in its own right! c. LDS PRF - Pedigree Resource File (individual only - PRF doesn't have family records). Additional features and format recognition will be added periodically. Upgrades are always free for registered users.